Silvertown 2004 by unknown artists. Household? . A portrait of local Silvertown Pubs. Many of you won't have been to Silvertown, an area of East London located near the City Airport, the northside of the Thames Flood Barrier and home to the Tate and Lyle Factory. It's also the current location of the Brick Lane Music Hall, a modern day celebration of music hall style entertainment set up in the 1990s by Vincent Hayes. It was originally housed in the Truman brewery before moving to Shoreditch and then finally settling in the former church of St Marks, Silvertown. In the front yard of the old church is a war memorial. 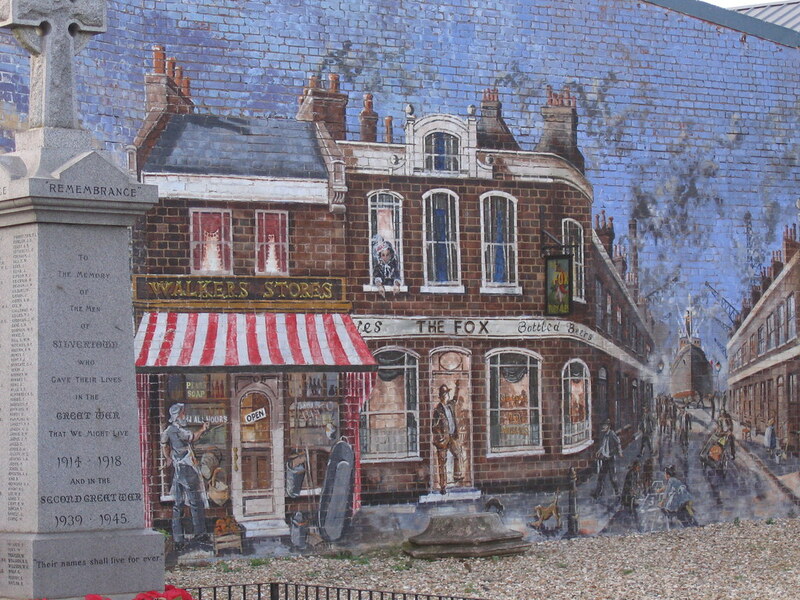 A mural has been painted behind depicting a Victorian era street scene including local pubs, The Fox and The Connaught, both which could be found on the North Woolwich Road. This mural is unusual as the pub signs are miniature versions fixed onto the wall making the piece 3-D! The piece was painted by the Music Hall's 'in house' artist Chris Floyd. It was created to compliment the War Memorial with the poppy fields situated behind it and then added to in order to create a visual image of the Royal Docks as it was before the closure. Getting close to the mural is a little difficult when the building is closed, however it is viewable from the road. So if you ever find yourself in Silvertown, have a look at the music hall and its mural. The mural is in a very good condition. Travel to the London City Airport Station. From here, take a left and follow Hartmann Road til it finishes at the junction of Connaught Road. Take a left down this road. Cross over so you are walking alongside the old railway line. You will see a bridge ahead. Take that over the train tracks and you should end up on North Woolwich Road. Take a right up this road and you should get to the Brick Lane Music Hall.